I promised myself I’d put in some practice time baking cakes, since this is a weak area for me. I don’t know about you but something deep within me me rebels at baking a cake when I can make their quicker, cuter cousin – Mr. Cupcake. But I’d promised myself I’d give it a go, so I did. And I’m glad I took the time!! Sometimes the simplest creations are the most beautiful. The cake is a simple yellow cake recipe infused with a lot of apricot liqueur. Booze makes baking much easier, I’ll tell you that. 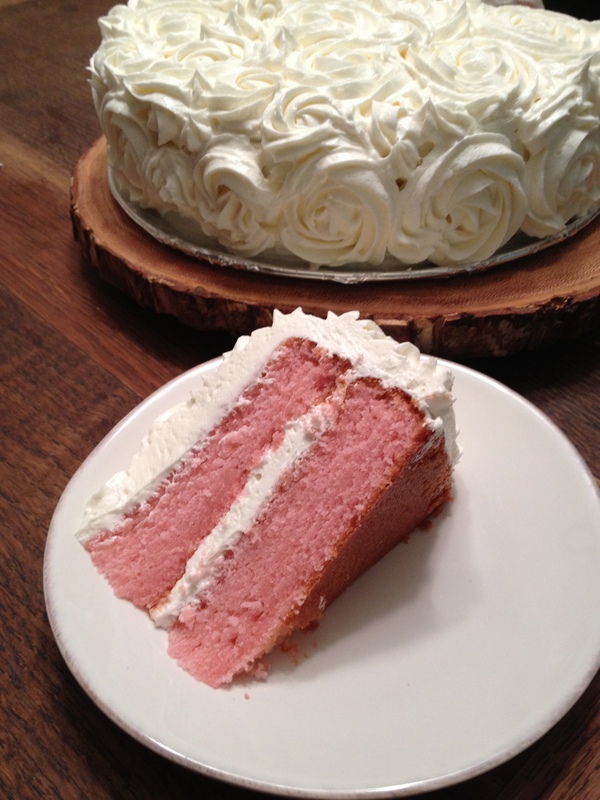 I dyed the cake a rather ridiculous shade of pink in honor of October’s Breast Cancer Awareness Month. Don’t forget to do self-checks and get screened, if necessary! Overall, I give my icing job a ‘C.’ Lots of practicing to do. But if a cake novice like myself can turn out a decent result, be heartened! And I’ll tell you what: learn how to do your first breast self-check or get a mammogram and I’ll bake you a cake. Because staying healthy is just that important. …And then we’ll go walk off the calories together. Because staying healthy is just that important.